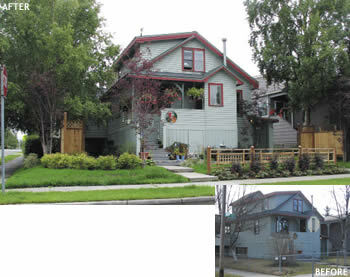 A chain link fence was among the uninviting elements of this downtown Anchorage property. Inspiring Spaces Alaska helped define the space and create a warm entrance. Wooden screens with glass inserts beautifully outline the area, and the use of large Canada Red Cherry trees add color and warmth to the landscape (and serve as winter interest later on). Do you cringe when the clean covering of snow blanketing your yard begins to melt in the spring? Are you thinking about selling your home but not sure how to create more curb appeal? Do you wish you could have a yard that is well tended and colorful but you don't know the first thing about gardening? If your answer to any of these questions is yes, you might want to consider the services of a landscape designer. Also called a landscape architect, a designer uses the artistic elements of design to create a landscape that is both functional and aesthetically pleasing. Although he or she will include the basic principles of design – color, form, line, scale and texture – a landscape designer can also make sure your garden is a practical space that is a reflection of your own tastes. They can save you ample research time, since they know important facts such as which plants are moose-resistant and which grow best in Alaska's climate. You don't need to be wealthy to consider a landscape designer – hiring a professional can be as simple as having someone draw up a design or as in-depth as a complete overhaul. Usually, employing the services of a designer can save you money in the future, as they are familiar with city setbacks, neighborhood covenants, and easements. A designer will think ahead, making sure that you won't need to cut anything down or tear anything out in several years' time. The extent of the project will determine the price, but Tania Krawchenko of Inspiring Spaces Alaska Landscape Design advises expecting to pay at least ten percent of your home's value for a major renovation. "Alaska is expensive," Krawchenko notes. "Many materials have to be shipped from the Lower 48." If you have a tight budget and a small project, you don't need to contract a complete overhaul. A designer can still help you with your vision by creating a design plan. A design plan is a to-scale "bird's-eye" illustration of your yard project, and will include elevations, annotations, and a detailed plant list. Many landscaping companies only draw up plans as part of a larger project, but it is possible to hire a professional to simply draw up your plan. To create a drawing, a designer will meet with you, make a site analysis, take photos and then produce an interpretation of your ideas that allows you to see how different elements will fit together. "Designers work with clients on an intimate basis," Krawchenko explains. "We combine our knowledge with our artistic eyes, or the practical with the creative. Since a designer is expressing the client's wishes creatively, it's important that everyone 'clicks.'" After you receive the design, it is up to you how you would like the work to be done. The designer can recommend contractors based on your needs, or, if the work is not too technical, you can do it yourself. Krawchenko notes that she will shop with clients who wish to do the labor themselves, in order to ensure that they choose quality plants. "Plants should be started in the right zone," she says. "Some get started too far south, so even though they look good in the nursery environment, they won't thrive in the long run." It is also common for clients to overdo it while shopping at a nursery, since it is easy to be dazzled by the array of choices. Krawchenko helps keep them in check. A landscape designer isn't limited to working with greenery. If you enjoy entertaining outdoors, for example, a designer can help with "hardscaping," or the creation of walkways, patios and decks. If you need a retaining wall, they can make certain the job is done correctly. Glenn Ball of Ground Effects Landscaping suggests bringing a copy of your home's as-built to a consultation. "The as-built has property lines and all the utilities right there," he explains, "so using that saves a lot of time." Hardscaping adds to the price considerably, but Krawchenko points out that most people wouldn't have their homes designed by a carpenter instead of an architect: "You need to think about drainage, and utilities," she says. "It's very serious." When you decide it's time to enlist the services of a designer, Krawchenko recommends starting to plan in the off-season. If you begin planning in fall or winter, your design will be completed early enough to line up a contractor for the spring. "That way you'll be enjoying your yard over the summer," she says. "Planning over the off-season is the best advice I can give." Before you approach a designer, spend a little time getting ideas. Magazines are an excellent place to find visuals – keep a notebook or journal with images you like. Anvy Crawford, executive assistant at Faltz Landscaping in Anchorage, advises thinking about what you like about your yard, and what you wish you could change. "For example, would you like to hide your view of the neighbors?" she asks. While designers can help you add form to a hazy idea, it's prudent to have some notion of the direction you would like to take your garden. Are you looking for a few trees and some ground cover, or do you want something more elaborate, such as a patio and lily pond? Krawchenko notes that it might take a few years to fully appreciate the success of a design as plants mature and fill out, but when you arrive at that point you will forget about the money you spent because your space will feel so right. "A space should evoke a feeling," she declares. "If it evokes a feeling, then I have succeeded."